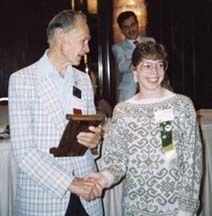 The James E. Charlton Junior Award was established in 1969 as an annual presentation for the best exhibit of Canadian coins displayed by a Junior member (under 18 years of age) at the R.C.N.A. Convention. As a great believer in the importance of encouraging young people to take an interest in our hobby Mr. Charlton created an award to acknowledge excellence in exhibits. The C.N.A. Executive named the award in his honour and to acknowledge his generous financial support toward this award. When the award was established a large trophy was purchased with individual plaques located at the base to record the names of the recipients. This trophy was presented to the winning junior exhibitor during the Convention awards ceremonies. The recipient would return the trophy the following year. As a convenience to recipients this practice has been replaced with an award of an individual plaque that the winner can keep. 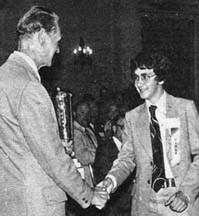 Mr. Charlton congratulating Colin Caldwell (1976).